Can you help us clothe a person? People sleeping rough don’t get to change their clothes or underwear, or even to wash, very often. This means that skin disease and fungal infections are rife. This weekend we distributed 150 pairs of joggers at Dunkerque – but it’s hard to do. The trousers that are donated to us are often too big for the refugees, who are ethnically smaller than UK males, and the refugees have a poor diet so they are often very thin. 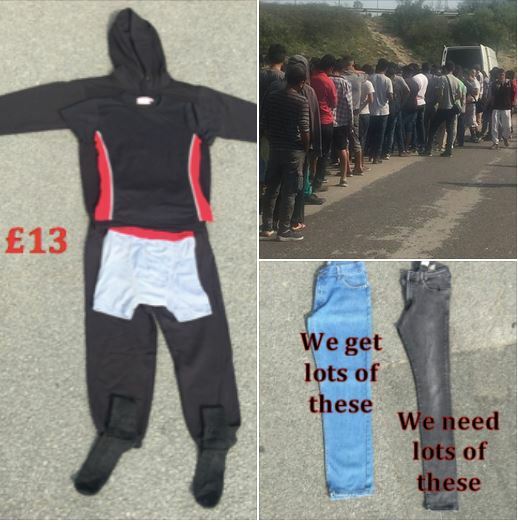 We can fully clothe a refugees with a new hoodie, joggers, tee shirt, boxer shorts and socks all for just £13. If you can donate £13 to help us do this please follow this link now.